Torchères were popular fixtures in most Art Deco interiors, including many spaces at Cranbrook. One of twelve originally ordered for the dining hall at Kingswood School Cranbrook, torchères like this one are still used today at Kingswood. The design allows the room to be lit indirectly, as light is aimed towards the ceiling, while the machine-age layered and inverted funnel forms further reflect light on the underside of the polished funnels. While serving as excellent light sources, they also add an element of Art Deco glamour. Walter von Nessen came to the United States from Germany in the 1920s and quickly became the most innovative designer of modern residential lighting. Von Nessen used nontraditional materials to create lamps and light fixtures that diffused light in accordance with his exacting standards while creating a decidedly modern sensibility. Eliel Saarinen was aware of von Nessen’s progressive pieces and often approached von Nessen to manufacture his own designs for metalwork, including this torchère. 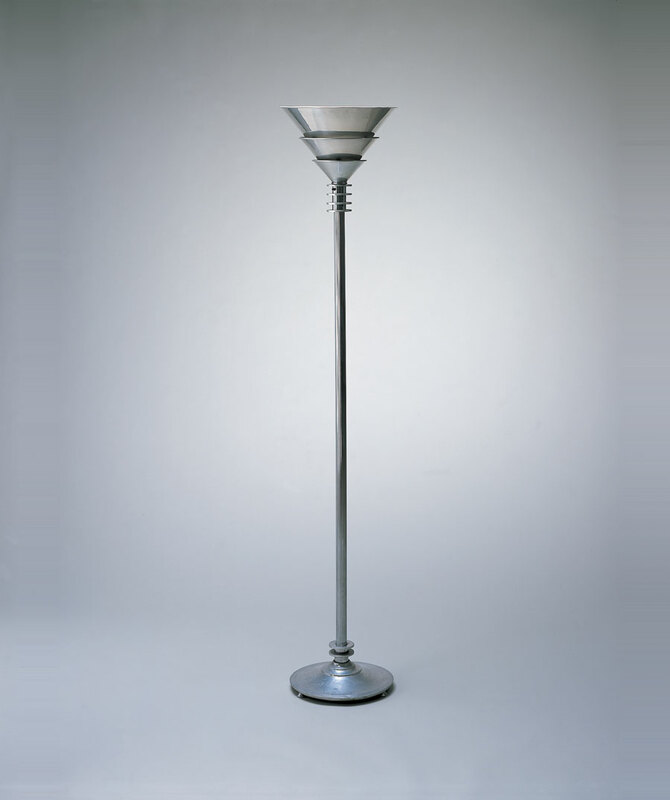 Nessen Studio retained the rights to the lamp and manufactured it for other projects in the late 1920s and early 1930s.